What small RNAs are expressed? What RNA features have significantly different numbers of small RNAs targeting them between two conditions? Process small RNA-seq datasets to determine quality and reproducibility. Filter out contaminants (e.g. rRNA reads) in small RNA-seq datasets. Differentiate between subclasses of small RNAs based on their characteristics. Identify differently abundant small RNAs and their targets. Small, noncoding RNA (sRNA) molecules, typically 18-40nt in length, are key features of post-transcriptional regulatory mechanisms governing gene expression. Through interactions with protein cofactors, these tiny sRNAs typically function by perfectly or imperfectly basepairing with substrate RNA molecules, and then eliciting downstream effects such as translation inhibition or RNA degradation. Different subclasses of sRNAs - e.g. microRNAs (miRNAs), Piwi-interaction RNAs (piRNAs), and endogenous short interferring RNAs (siRNAs) - exhibit unique characteristics, and their relative abundances in biological contexts can indicate whether they are active or not. In this tutorial, we will examine expression of the piRNA subclass of sRNAs and their targets in Drosophila melanogaster. The data used in this tutorial are from polyphosphatase-treated sRNA sequencing (sRNA-seq) experiments in Drosophila. The goal of this study was to determine how siRNA expression changes in flies treated with RNA interference (RNAi) to knock down Symplekin, which is a component of the core cleaveage completx. To that end, in addition to sRNA-seq, mRNA-seq experiments were performed to determine whether targets of differentially expressed siRNAs were also differentially expressed. The original published study can be found here. Because of the long processing time for the large original files - which contained 7-22 million reads each - we have downsampled the original input data to include only a subset of usable reads. In this exercise we will identify what small RNAs are present in Drosophila Dmel-2 tissue culture cells treated with either RNAi against core cleavage complex component Symplekin or blank (control) RNAi (published data available in GEO at GSE82128). In this study, biological triplicate sRNA- and mRNA-seq libraries were sequenced for both RNAi conditions. After removing contaminant ribosomal RNA (rRNA) and miRNA reads, we will identify and quantify endogenous siRNAs from sequenced reads and test for differential abundance. We will follow a popular small RNA analysis pipeline developed for piRNAs by the Phillip Zamore Lab and the ZLab (Zhiping Weng) at UMass Med School called PiPipes. Although PiPipes was developed for analysis of piRNAs, many of the basical principles can be applied to other classes of small RNAs. It is of note that this tutorial uses datasets that have been de-multiplexed so that the input data files are a single FASTQ formatted file for each sample. Because sRNAs are typically much smaller than fragments generated for RNA-seq or other types of deep sequencing experiments, single-end sequencing strategies are almost always used to sequence sRNAs. This tutorial uses the Collections feature of Galaxy to orgainze each set of replicates into a single group, making tool form submission easier and ensuring reproducibility. Due to the large size of the original sRNA-seq datasets, we have downsampled them to only inlcude a subset of reads. 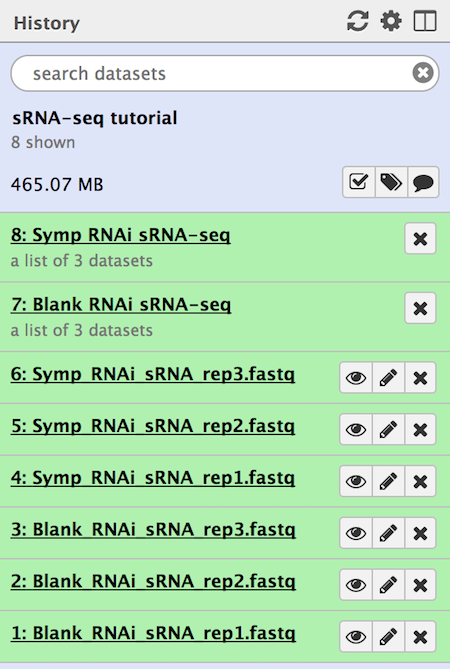 These datasets are avaialble at Zenodo where you can find the FASTQ files corresponding to replicate sRNA-seq experiments and additional annotation files for the Drosophila melanogaster genome version dm3. Set the datatype of the read (.fastqsanger) files to fastq As default, Galaxy takes the link as name, so rename them. Read quality scores (phred scores) in FASTQ-formatted data can be encoded by one of a few different encoding schemes. Most Galaxy tools assume that input FASTQ files are using the Sanger/Illumina 1.9 encoding scheme. If the input FASTQ files are using an alternate encoding scheme, then some tools will not interpret the quality score encodings correctly. It is good practice to confirm the quality encoding scheme of your data and then convert to Sanger/Illumina 1.9, if necessary. 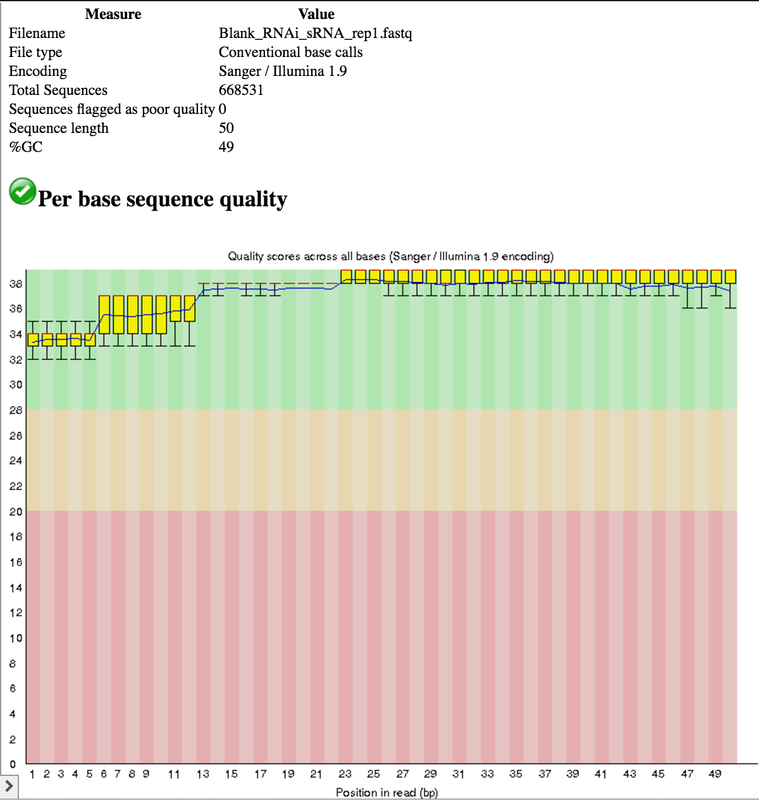 We can check the quality encoding scheme using the FastQC tool (further described in the NGS-QC tutorial). What quality score encoding scheme is being used for each sample? What is the read length for each sample? What does the base/read quality look like for each sample? Are there any adaptors present in these reads? Which one(s)? All samples use the Illumina 1.9 quality encoding scheme, so we do not need to convert. All samples have a read length of 50 nt. The base quality across the entire length of the reads is good (phred score > 28 for the most part). Yes, the “Illumina Universal Adapter” is present. Go back to the FastQC tool and scroll down to the “Adapter Content” section. You can see that Illumina Universal Adapters are present in >80% of the reads. The next step is to remove these artificial adaptors because they are not part of the biological sRNAs. If a different adapter is present, you can update the Adapter sequence to be trimmed off in the Trim Galore! tool step described below. sRNA-seq library preparation involves adding an artificial adaptor sequence to both the 5’ and 3’ ends of the small RNAs. While the 5’ adaptor anchors reads to the sequencing surface and thus are not sequenced, the 3’ adaptor is typically sequenced immediately following the sRNA sequence. In the example datasets here, the 3’ adaptor sequence is identified as the Illumina Universal Adapter, and needs to be removed from each read before aligning to a reference. We will be using the Galaxy tool Trim Galore! tool which implements the cutadapt tool for adapter trimming. FastQC tool on each collection of trimmed FASTQ read files to assess whether adapters were successfully removed. The read lengths range from 12 to 50 nt after trimming. No, Illumina Universal Adaptors are no longer present. No other adapters are present. 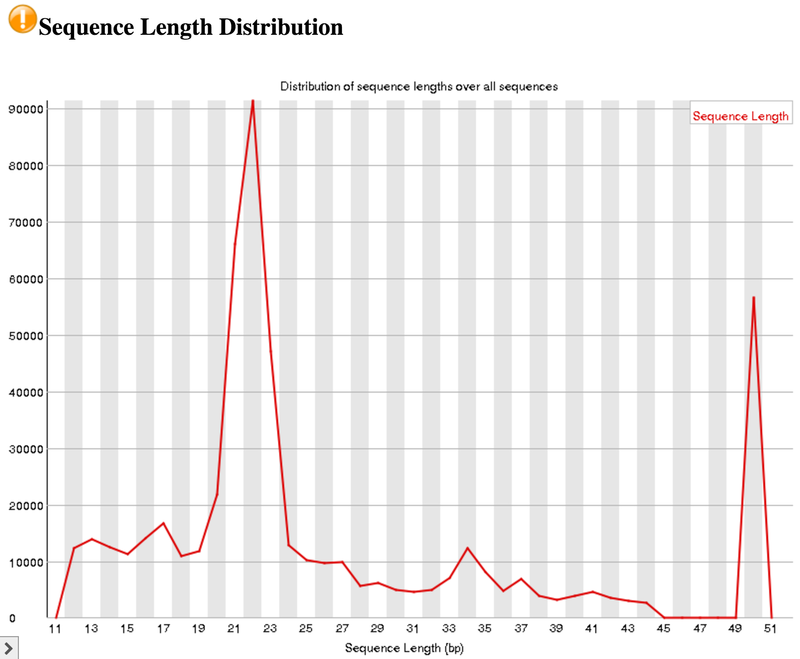 An interesting thing to note from our FastQC tool results is the Sequence Length Distribution results. While many RNA-seq experiments have normal distribution of read lengths, an unusual spike at 22nt is observed in our data. This spike represents the large set of endogenous siRNAs that occur in the cell line used in this study, and is actually confirmation that our dataset captures the biological molecule we are interested in. Now that we have converted to fastqsanger format and trimmed our reads of the Illumina Universal Adaptors, we will align our trimmed reads to reference Drosophila rRNA and miRNA sequences (dm3) to remove these artifacts. Interestingly, Drosophila have a short 2S rRNA sequence that is 30nt long and typically co-migrates with sRNA populations during gel electrophoresis. rRNAs make up a very large proportion of all non-coding RNAs, and thus need to be removed. Oftentimes, experimental approaches can be utilized to deplete or avoid capture of rRNAs, but these methods are not always 100% efficient. We also want to remove any miRNA sequences, as these are not relevant to our analysis. After removing rRNA and miRNA reads, we will analyze the remaining reads, which may be siRNA or piRNA sequences. To first identify rRNA-originating reads (which we are not interested in in this case), we will align the reads to a reference set of rRNA sequences using HISAT2 tool, an accurate and fast tool for aligning reads to a reference. We now need to extract the unaligned reads from the output BAM file for aligning to reference miRNA sequences. We can do this by using the Filter SAM or BAM, output SAM or BAM tool to obtain reads with a bit flag = 4 (meaning the read is unaligned) and then converting the filtered BAM file to FASTQ format with the Convert from BAM to FastQ tool. Next we will align the non-rRNA reads to a known set of miRNA hairpin sequences to identify miRNA reads. For this tutorial we are not interested in miRNA reads, so we need to extract unaligned reads from the output BAM files. To do this, repeat the Filter SAM or BAM, output SAM or BAM tool steps for each dataset collection. Finally, rename the converted FASTQ files something meaningful (e.g. “non-r/miRNA control RNAi sRNA-seq”). In some instances, miRNA-aligned reads are the desired output for downstream analyses, for example, if we are investigating how loss of key miRNA pathway components affect levels of pre-miRNA and mature miRNAs. In this case, the BAM output of HISAT2 can directly be used in subsequent tools as it contains the subset of reads aligned to miRNA sequences. In Drosophila, non-miRNA small RNAs are typically divided into two major groups: endogenous siRNAs which are 20-22nt long and piRNAs which are 23-29nt long. We want to analyze these sRNA subclasses independently, so next we are going to filter the non-r/miRNA reads based on length using the Manipulate FASTQ tool tool. Manipulate FASTQ tool on each collection of non-r/miRNA reads to identify siRNAs (20-22nt) using the following parameters. The regular expression in the Match by parameter tells the tool to identify sequences that are length 12-19 or 23-50 (inclusive), and the Miscellaneous Manipulation Type parameter tells the tool to remove these sequences. What remains are sequences of length 20-22nt. We will now repeat these steps to identify sequences in the size-range of piRNAs (23-29nt). 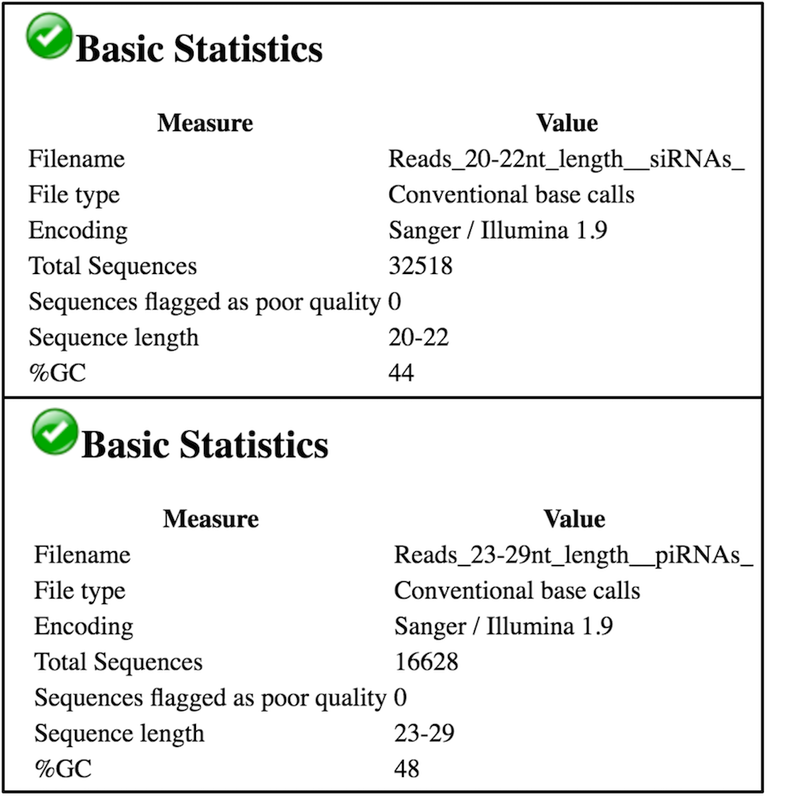 FastQC tool: Run FastQC on each collection of siRNA and piRNA read files to confirm the correct read lengths. 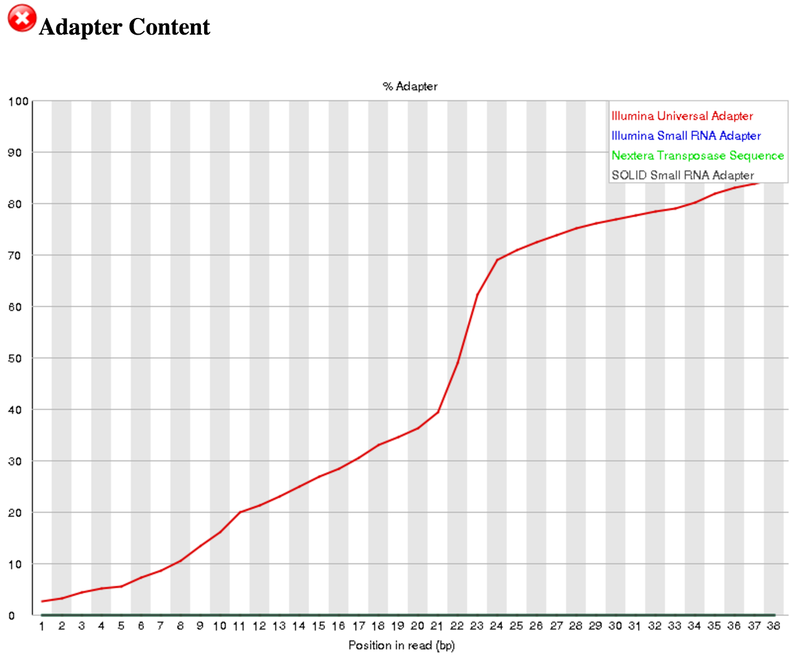 We see in the above image (for Blank RNAi, replicate 3) that we have ~32k reads that are 20-22nt long in our Reads_20-22_nt_length_siRNAs file and ~16k reads that are 23-29nt long in our Reads_23-29_nt_length_piRNAs file, as expected. Given that we had ~268k trimmed reads in the Blank RNAi replicate 3 file, siRNAs represent ~12.1% of the reads and piRNAs represent ~6.2% of the reads in this experiment. There is no distinct peak in the piRNA range (you can find the example of the real piRNA profile in Figure 1 from Colin D. Malone et al, 2009. The next step in our analysis pipeline is to identify which RNA features - e.g. protein-coding mRNAs, transposable elements - the siRNAs and piRNAs align to. Most fly piRNAs originate from and thus align to transposable elements (TEs) but some also originate from genome piRNA clusters or protein-coding genes. siRNAs are thought to inhibit TE mobility and potentially target mRNAs for degradation via an RNA-interference (RNAi) mechanism. Ultimately, we want to know whether an RNA feature (TE, piRNA cluster, mRNA, etc.) has significantly different numbers of siRNAs or piRNAs targeting it. To determine this, we will use Salmon tool to simultaneously align and quantify siRNA reads against known target sequences to estimate siRNA abundance per target. For the remainder of the tutorial we will be focusing on siRNAs, but similar approaches can be done for piRNAs, miRNAs, or any other subclass of small, non-coding RNAs. We want to identify which siRNAs are differentially abundance between the blank and Symplekin RNAi conditions. To do this we will implement a counting approach using Salmon tool to quantify siRNAs per RNA feature. Specifically, we will analyzing mRNA and TE elements by counting siRNAs against a FASTA file of transcript sequences, not the reference genome. This approach is especially useful in this case because we are interested in TEs, which occur at many copies (100s - 1000s) in the genome, and thus will result in multiple alignments if we align to the genome with a tool like HISAT2 tool. Further, we will be counting abundance of siRNAs that align sense or antisense to an RNA feature independently, as opposite sense alignments are correlated with unique downstream silencing effects. Then, we will provide this information to DESeq2 tool to generate normalized counts and significance testing for differential abundance of siRNAs per feature. The output of Salmon tool includes a table of RNA features, estimated counts, transcripts per million, and feature length. We will be using the TPM quantification column as input to DESeq2 tool in the next section. DESeq2 tool is a great tool for differential expression analysis, but we also employ it here for estimation of abundance of reads targeting each of our RNA features. As input, DESeq2 tool can take transcripts per million (TPM) counts produced by Salmon tool for each feature. TPMs are estimates of the relative abundance of a given transcript in units, and analogously can be used here to quantify siRNAs that align either sense or antisense to transcripts. Filter tool to extract features with a significantly different antisense siRNA abundance (adjusted p-value less than 0.05). How many features have a significant difference in antisense and sense siRNA abundance in the Symplekin RNAi condition? There are 87 antisense and 15 sense features that have significanlty different siRNA abundances. For more information about DESeq2 and its outputs, have a look at DESeq2 documentation. Analysis of small RNAs is a complicated and intricate process due to the diversity in characteristics, functionality, and nuances of small RNA subclasses. The goal of this tutorial is to introduce you to a common small RNA workflow that specifically identifies changes in endogenous siRNA abundances that target protein-coding mRNAs and transposable elements. The steps presented here can be rearranged and modified based on small RNA features of specific systems and the needs of the user. Analysis of small RNAs is complex due to the diversity of small RNA subclasses. Both alignment to references and transcript quantification approaches are useful for small RNA-seq analyses. This material is the result of a collaborative work. Thanks to the Galaxy Training Network and all the contributors ( Mallory Freeberg)!